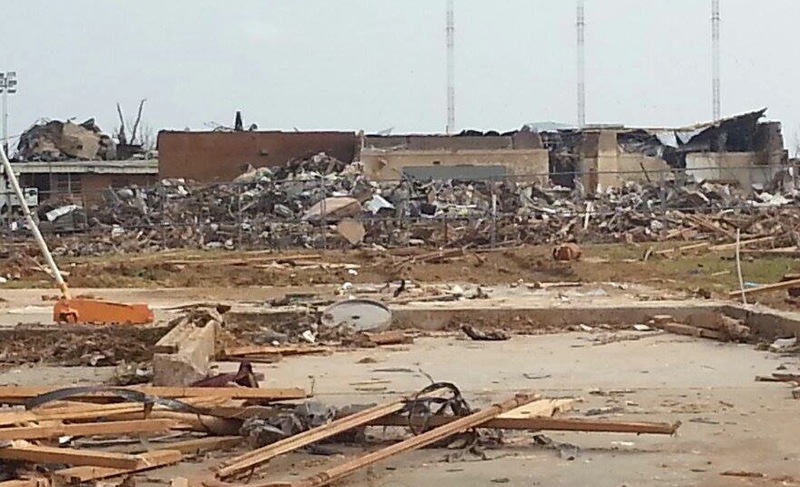 Seven students died when a tornado struck Plaza Towers Elementary School in Moore. A toppled tree impedes traffic on Midwest Boulevard in storm-ravaged Oklahoma City. A member of the Pathfinder Search and Rescue Team and his trained beagle head for the disaster zone to search for tornado victims. A man uses a baby stroller to transport household possessions out of the tornado zone in Moore. "I've seen better times," he said as he kicked the back wheel to keep it from falling off. A toppled sign rests about a half-block from its original site as two Oklahoma City residents hand out water, snacks and first aid provisions to tornado refugees. James Rey and Leah Olwell said they rounded up the supplies and headed for the site after hearing media reports about the disaster. Chris Wright, a geography teacher at Highland West Junior High in Moore, hands out bottled to people trekking to and from the disaster site. Three men ride in a trailer loaded with storm doors in a neighborhood near the tornado site in Moore. Plaza Towers Elementary School was destroyed by the tornado. A pair of mud-soaked boots lie abandoned as tornado refugees pass by on Santa Fe Avenue. Plaza Towers Elementary, the school in Moore where seven children died in a tornado strike today, has more than 400 students, most of them low-income. Three-fourths of the students are White and 15 percent are Hispanic. Its students have generally scored above the state average on state standardized tests. Its 20 or so teachers have an average of a little over 10 years’ experience, slightly less than the state average. Greatschools.org, a national site that profiles schools, rated the school eight out of 10. However, its letter grade from the state was a C.
On Google, people from around the country Monday night were posting notes on a Plaza Towers Elementary School page. “Prayers for all members of the school & the community. Our hearts are breaking for you,” a person named Linda Ruhl said. “Prayers from New Jersey. God bless you,” an unidentified user said. “I lived through Sandy … Be strong! Stay strong! My thoughts are with you guys,” said another. One person raised questions about whether children in schools are adequately protected.